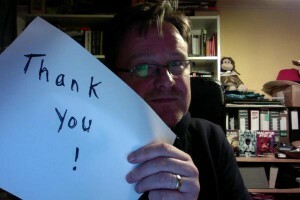 The second round of voting for the BSFA Awards is now open. If you’re a member of the British Science Fiction Association, you can make your selections from a long list of works on the Association’s website. You’ll find a link to the ballot here. Voting remains open until 31st January. Macaque Attack features in Den Of Geek‘s list of top books of 2015. I remember seeing the first book – Ack Ack Macaque – in bookstores and being tempted by that irresistible title, but I worried that a story about a one-eyed cigar-chomping monkey WWII pilot who fights Nazis might be a little too… well… silly? Eventually I gave in and found myself blazing through the entire trilogy in a few days. It’s that addictive. Powell has created a vast, thoroughly original world that is so imaginative, emotionally engaging and frighteningly real that you don’t want to leave it. 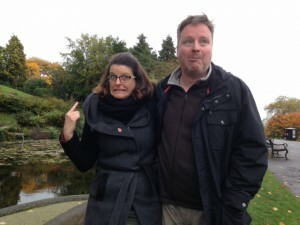 His characters – human, simian and, uh, other! – are beautifully crafted and written with a depth and sincerity that gives them life. This grounding keeps the story tight even when Powell plays fast and very loose with reality. Although Macaque Attack! focuses more on shock twists and action sequences than its predecessors, the setup has been handled so carefully that you’ll be primed for this gloriously entertaining pay-off. These books have brightened my year. 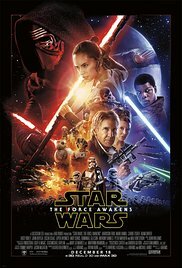 I took my family to see Star Wars: The Force Awakens last night, and absolutely loved it. You see, I’ve grown up with these characters. Han, Luke, Leia, Chewie and the droids. We used to pretend to be them in the playground; I followed their adventures in comics and novels; I recreated their escapades with action figures and thinly disguised fan fiction; and I desperately wanted to be Han Solo. To see them back on the screen after all these years was an emotional experience, and I’m not ashamed to say I had tears running down my face at certain points during the film. Just seeing the Millennium Falcon in flight brought a lump to my throat. But this wasn’t just an exercise in nostalgia. The new generation of characters more than held their own. And, speaking as the father of two pre-teenage girls, it was refreshing to have a resourceful, self-reliant female lead who wasn’t defined by her romantic entanglements. Rey is the sort of role model I’m more than happy for my girls to look up to. In fact, she’s now one of my favourite Star Wars characters. In addition, Finn was a relatable hero with an interestingly complex back story, and Kylo Renn the conflicted, tragic anti-hero Anakin Skywalker should have been. I’m excited to see where their journeys are going to take them next. I would say I loved this film the way I haven’t loved a film since The Empire Strikes Back. The prequels didn’t do it for me, and while Return Of The Jedi is a great movie, it also feels very final. It feels like the end of the road. Whereas the thing I dig most about Empire and Awakens is that they both raise a million questions, and thereby fire the imagination. The possibilities feel wide open and the universe feels alive once again. I’ve already written about What Star Wars Meant To A Small Town Kid From England. Having seen The Force Awakens, I feel like that kid again, with a whole sprawling cosmos of wonder ahead of him. ‘Tis the season when a writer’s thoughts turn to cobbling together a retrospective look at the year. But rather than churning out the usual lists of books read or movies watched, I thought I’d take a look at some highlights that meant a lot to me personally. I got invited to run a genre fiction workshop for the creative writing students at Aberystwyth University. To get there, I had to drive through some of the best scenery in Wales. There’s nothing like several hours alone in a car, surrounded by stunning valleys and mountains, to refresh the soul. The workshop went well, as did the reading afterwards. I got to talk about the nitty-gritty of writing with people who were interested to hear what I had to say. 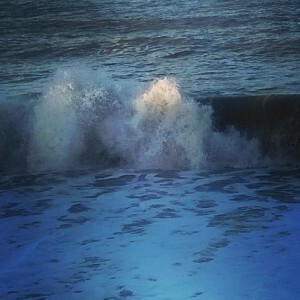 And the next morning, an early walk along the beach allowed the sea air to blow all the cobwebs from my mind. 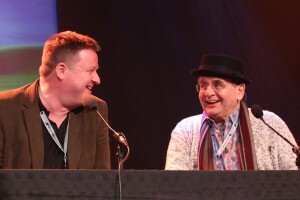 This year, I attended the SFWeekender in North Wales, where I got to play Just A Minute on stage with Sylvester McCoy and Sophie Aldred. 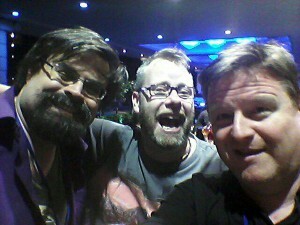 I went to Eastercon at Heathrow, where I had the honour of hosting the BSFA Awards ceremony. I went to Nine Worlds, where I spent three enjoyable days catching up with friends and colleagues while experiencing possibly the worst bar service I’ve ever encountered. Nottingham, where I played several panel games and sang a karaoke version of ‘Sweet Child O’ Mine’ with Emma Newman, Donna Scott and Neil Bond. My main recollection of the weekend, however, (apart from the disco and the late night drinking sessions) was of walking on my own between the hotel and the convention centre as the Moon rose from behind the hedge and the fairy lights came on in the trees, turning a drab campus car park into an enchanted space. 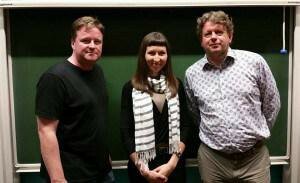 I was lucky enough to be invited to interview Peter F Hamilton for the BSFA in London. He was a joy to talk to, and has kindly agreed to return the favour next year, when he will be interviewing me! I also got to read my work and talk about genre fiction at Bristol’s Novel Nights salon, and at the Super Relaxed Fantasy Club in Holborn. 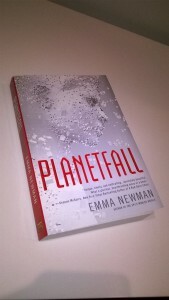 The book I enjoyed reading most this year was Planetfall by Emma Newman. I first read it some time ago, when it only existed as a Word document, and was blown away. It’s a heartbreaking, compulsive tale that deserves a place in the pantheon of science fiction classics. A brilliant book. If you haven’t read it yet, I humbly suggest you do so with all haste. 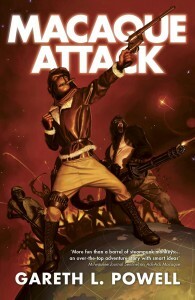 As regular readers will know, Macaque Attack, the third part of my ‘Ack-Ack’ trilogy was published by Solaris Books in January 2015, and accompanied by a signing tour that took in Southampton, London, Cambridge, Bristol, Liverpool and Birmingham. 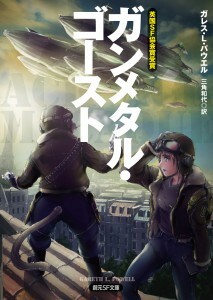 Then, in December, the Japanese translation of Ack-Ack Macaque appeared, under the title Gunmetal Ghost, and I started hoping my work might find a whole new audience abroad. Also, the cover they gave the book was amazing, and I instantly fell in love with it. At the time of writing, Gunmetal Ghost is at number three in the Amazon military fiction chart, so you never know, it might prove to be a hit. And to cap off a great year, I found that a short story of mine (‘Red Lights, And Rain’) was included in Gardner Dozois’ Year’s Best Science Fiction anthology, and another of mine mentioned in the book’s ‘honourable mentions’ section. I could not have been more chuffed. 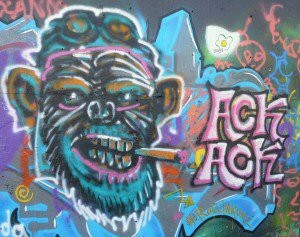 I woke one morning in September to find an artist called Rollin Kunz had spray-painted this striking, 6ft tall portrait of Ack-Ack Macaque on a wall in Austin, Texas. I take the existence of this picture as a huge compliment, and my only regret is that I can’t immediately fly over to Texas to see it in person. Of course, Star Wars made this list. Holy crap, it was brilliant. I sat through the whole film with a stupid grin on my face and tears running down my cheeks. I was seven years old all over again, and it was superb. I also enjoyed Avengers: Age of Ultron and Ant Man in the cinema, and I’m hoping to see The Martian at some point because I really enjoyed reading the book this year. As far as movies go, it’s a really great time to be a geek. But for me, the best part of 2015 was the time I spent with friends and family, whether in a hotel bar or simply having a coffee at home. It is the people you get to meet in this job that really make it special. And this gives me an excuse to include one of my favourite photos. I only get to see my sister two or three times a year, as she lives in rural France. This was taken when she was last over, in October. Aren’t we photogenic?